With Halloween's profile being raised more and more in the UK, I'm sure it won't be long before we start decorating Halloween Trees! 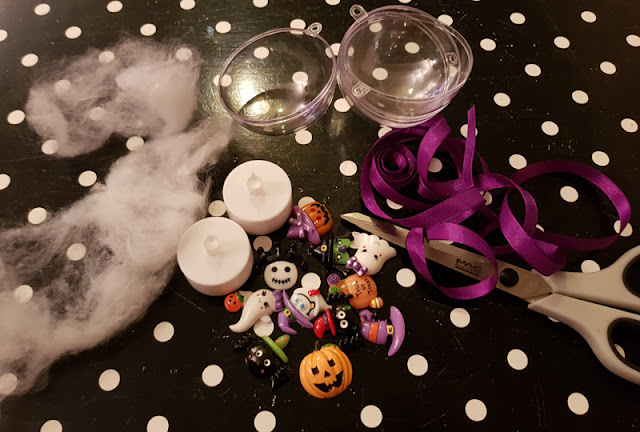 OK, that may be a bit extreme, but I have noticed over the years how it has become very popular in England, and with its popularity has come lots of amazing Halloween crafts to try. 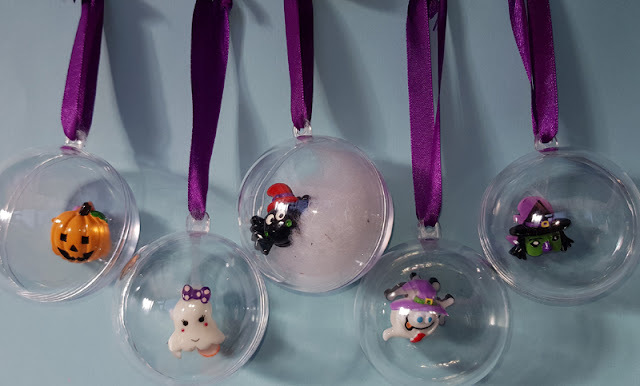 Last year I had a whole box full of clear baubles, I forget now what I needed them for, it may have been the Pokemon balls for my son's party bags that went very wrong! 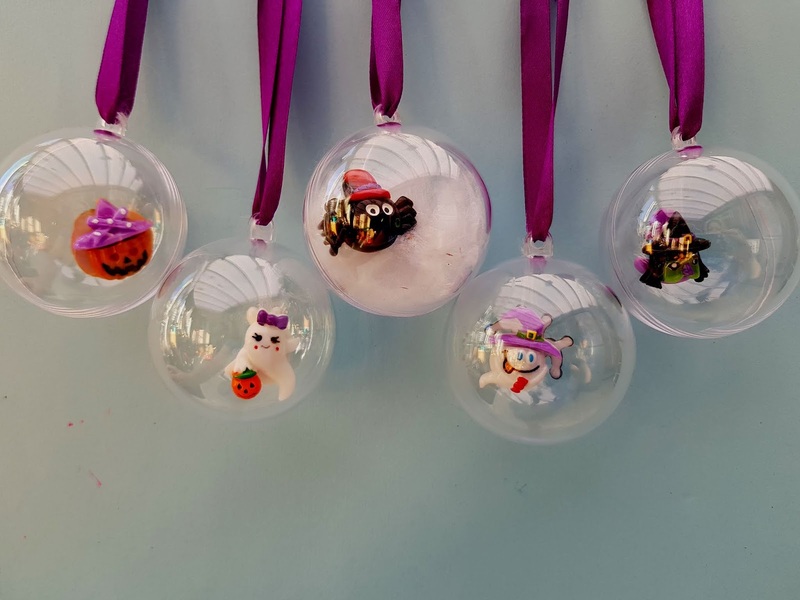 And when I made the pumpkin cushions I had sourced various Halloween, and spooky buttons from eBay and as I only used 2 I decided to put the rest in baubles! * Anything else small and spooky. Once I had all my materials ready, it was a very quick and easy project to make which even saw my child getting involved too. 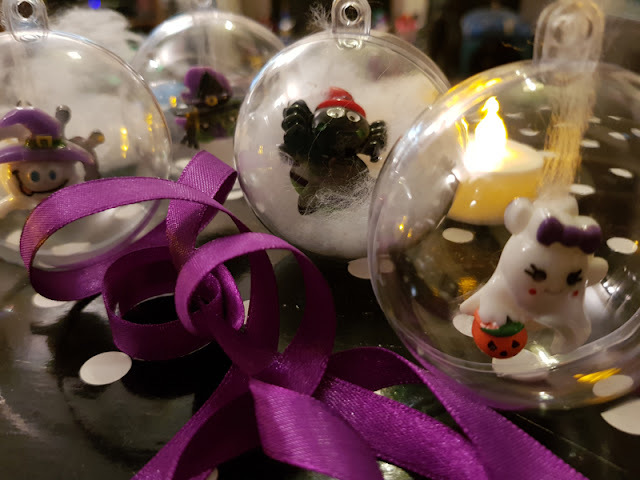 We opened up each bauble and filled it with a button or two, and even found a piece of wadding makes for a great spider's home. You can really go wild with these decorations and maybe take them further by adding LED lights and silhouettes in the balls. I wanted my buttons to hang rather than just sit in the bottom of the ball, so I used a very thin piece of wadding and tied the bottom around the buttonhole and the top I just snapped shut in the bauble. If you don't want the wadding showing, you can always use very fine thread, which you won't see so well in the dark. Once completed I added some ribbon across the top and my baubles were ready to hang. 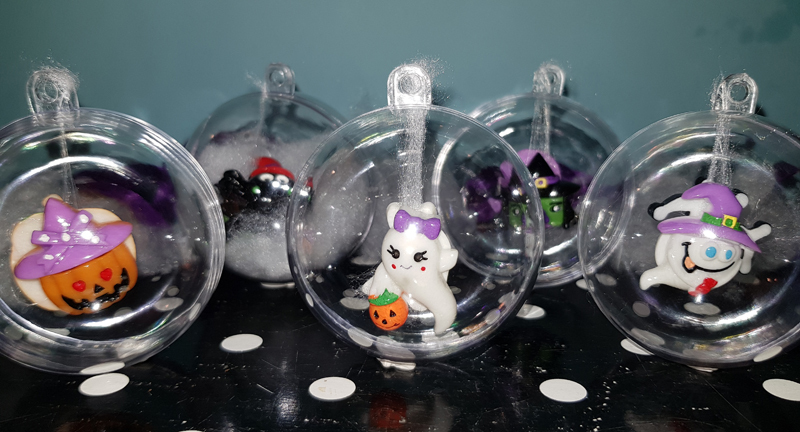 Have a spooktacular October, be sure to check out my other Halloween crafts and I'd love to hear what you guys will be getting up to over Halloween. Your baubles look fab. Yes why not have a Halloween tree. We always use a small branch as an Easter tree.